Target audience: Nonprofits, NGOs, cause organizations, businesses, brands, social media managers, marketing professionals. Like Facebook Pages and Google Plus Business Profiles, Twitter Brand Pages profiles are public. Brand Pages are only offered to a small group of advertising customers and marque accounts, but they will be rolled out for all brands and nonprofits some time in the near future. (Update: Twitter’s Claire Diaz that there are 6 nonprofits who received the updated profiles). 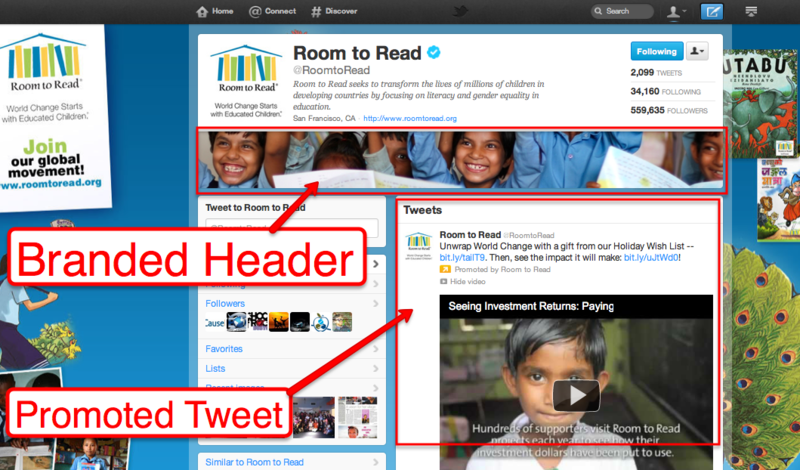 Branded header image: Twitter Brand Pages will allow you to include a 835×90 pixel image. You can swap this image out frequently to get more attention from your followers. Free promoted tweets: Twitter is allowing brands with enhanced profiles the ability to promote a Tweet to the top of their page’s timeline – for free. This will give your nonprofit the ability to feature specific videos, links or photos in the promoted tweet. Videos and photos will automatically expand within the page’s timeline. Exclusive content: Twitter mentions exclusive content, but it’s not clear how the content is exclusive if the content is public. It would be cool if – like Facebook reveal tabs – exclusive content is only displayed to followers. It seems that enhanced profiles offer nothing more than the ability to create a more controlled experience of your organization’s content. No doubt many other features will become available like analytics and more choices about featured content. But, you will still have to converse with people on Twitter. That will never change. What do you think of enhanced profiles?